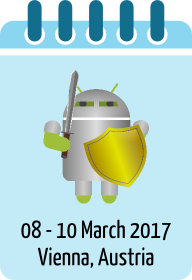 The second Android Security Symposium took place in Vienna, Austria, from 8-10 March 2017. The Android Security Symposium brought together 190 people from different backgrounds (academic, industry, rooting/exploiting community) who are interested in and actively working on Android device security. The event featured exciting expert talks on various topics around Android and mobile device security and privacy. The Android Security Symposium was organized by the Josef Ressel Center u'smile at the University of Applied Sciences Upper Austria in cooperation with SBA Research and the Institute of Networks and Security (INS) at Johannes Kepler University Linz. You can download our program folder here. You can download our venue guide here.